The holiday season is hitting its stride, and your family is likely getting into the festive spirit. While Christmas is probably the most important date on your children's radars, kids love celebrating New Year's Eve as well. Here are three New Year's resolutions that you can make with your little ones for 2013. Even if your kids earn good grades, there's always room for improvement. Make a resolution to help your children perform well academically. While your little ones will be responsible for time management, studying and finishing homework, make sure you're available to answer questions, offer guidance and provide moral support. As much time as your kids may spend playing computer games or watching movies, real play involves getting outside in the fresh air and running around. Encourage your children to devote more time to playing outdoors by becoming more involved with their activities. Everything from signing up to coach in a local sports league to tossing a baseball in the backyard will get the job done. Have your children been asking you to take them to the zoo for the first time? Been thinking about taking the family on a first-ever camping trip? 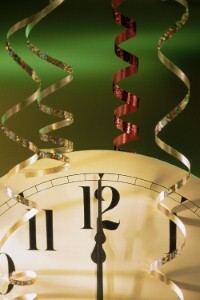 Mix things up in the new year by resolving to try new and different activities. Experimentation may just lead to a new family-favorite adventure.